The United States Congress designated the Rocky Mountain National Park Wilderness (map) in 2009 and it now has a total of 249,126 acres. All of this wilderness is located in Colorado and is managed by the National Park Service. The Rocky Mountain National Park Wilderness is bordered by the Indian Peaks Wilderness to the south, the Never Summer Wilderness to the west, the Neota Wilderness to the north, and the Comanche Peak Wilderness to the north. Following its initial recommendation for Wilderness protection, the stunning wild lands of Rocky Mountain National Park Wilderness sat in limbo for 35 years before finally being designated. This living showcase of the grandeur of the Rocky Mountains, with elevations ranging from 7,860 feet in the wet, grassy valleys to 14,259 feet at the weather-ravaged top of Longs Peak, provides visitors from around the world with countless opportunities for breathtaking experiences and adventures. The Continental Divide runs northwest to southeast through the center of the Wilderness atop the high peaks. Over one-third of the Wilderness is above treeline with more than sixty peaks over 12,000 feet. Longs Peak is the highest peak, and is an extremely popular destination during the summer months; Mount Meeker, at 13,911 feet, rises to the south. The headwaters of four major river basins; the Big Thompson, North Fork of the Colorado, North Fork of the St. Vrain, and the Cache La Poudre Rivers find their beginnings in the upper glaciated cirques. The slopes and valleys below these high peaks are mix of subalpine wonder, clear lakes, cold streams, spectacular forests of spruce, fir, lodgepole and ponderosa pine, and vibrant meadows supporting the robust biodiversity of the area. All rich with wildlife – mountain lions, elk, moose, bighorn sheep, mule deer, black bears, coyotes, eagles, hawks, songbirds, trout, and scores of smaller creatures – that delight wildlife watchers of all ages. The wonders of the Wilderness can be enjoyed year-round. Whether you take in the awe-inspiring views from along Trail Ridge Road in the summer or venture into the diverse and beautiful expanse of varied, wild terrain throughout the year. Over 350 miles of trails offer endless opportunities to hikers, backpackers and horseback riders while off trail travel and climbing abound for hearty adventure seekers. In spring and early summer wildflower-lovers are never disappointed when the meadows and hillsides are splashed with botanical color. Anglers, bird-watchers and photographers discover the splendor that they traveled so far to find. Autumn visitors can relax among the golden aspens or enjoy the rowdy antics of the elk rut (mating season). During the winter, snowshoers and cross-country skiers revel in the white-blanketed tranquility of meadows and forests. Temperatures are often moderate at elevations below 9,400' (2,865 m). At higher points, like Bear Lake, Trail Ridge Road, or Longs Peak, it may snow even in July. A wide variation between day and nighttime temperatures is also typical of mountain weather. Summer days in July and August often reach the 70's or 80's and drop into the 40's at night. The history of the West, a place where frontiersmen witnessed an untamed and awe-inspiring wilderness, is preserved in these lands. The fact that so many adjacent acres have survived intact is one to cherish: The Rocky Mountain National Park Wilderness provides a window to our past, keeping our history, and the inspirational power of the land, intact. The park lands have a long history of human use including Native American activities, homesteading, ranching, lodging, tourism and mountaineering. Traces of ancient trails, original routes and roads, and the remnants of cultural sites, early homesteads and lodges can still be found within the park. The Rocky Mountain National Park Wilderness is a window to the past and door to the future. 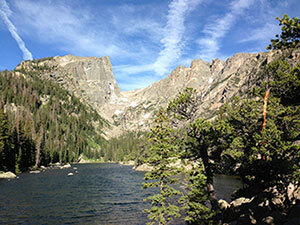 Planning to Visit the Rocky Mountain National Park Wilderness? How to follow the seven standard Leave No Trace principles differs in different parts of the country (desert vs. Rocky Mountains). Click on any of the principles listed below to learn more about how they apply in the Rocky Mountain National Park Wilderness.